Make a Marionette Puppet: Parts	* - Select -Kit/pattern combo, $11.00Kit only $8.00Pattern only $8.00 Order one item at a time. Fabric kit minus pattern is $8.00. No batting included. Kit/pattern combo, $11.50. No batting included. Adorable selection of small critters. Makes really cute pin cushions. Four little guys in one pattern. Chicks are about 4" tall, Mouse is about 6" long, Little Bit's shell is 5-1/2" wide and Motha's wings are 6" top to bottom. 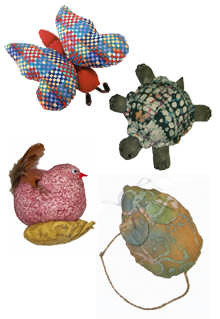 Use them as pin cushions, childrens toys or decorations. with Maddie Flutterby. They range from 4 to 6 inches and are filled with fiberfill. The pattern is full sized. We are sure you will love them. The fabric kit includes fabrics for all four. You will still need some fiberfill, glue for the eyes and of course, general sewing items (scissors, needle, threads, sewing machine, tape measure). Fabric in the kit may vary. Fiberfill, tacky glue or glue gun, marking pencil, scissors, wire cutters to trim pipe cleaner. For personal use only.